Conserving and extending habitats now rare elsewhere in Canterbury is one of the main aims of restoration. These dark hummocky bushes are among the last natural remnants of manuka on the Canterbury Plains. The younger plants are survivors from earlier restoration work. Many people think manuka is fit only for firewood, but its role as a major pioneer species was once vital. It colonised both wet and dry ground, forming a protective nurse for taller forest species. Manuka-shrub peatland also provides nectar for native butterflies and other insects. Restoring this habitat is made difficult by the manuka blight. This self-introduced scale insect and the associated sooty mould often kill manuka in eastern Canterbury. 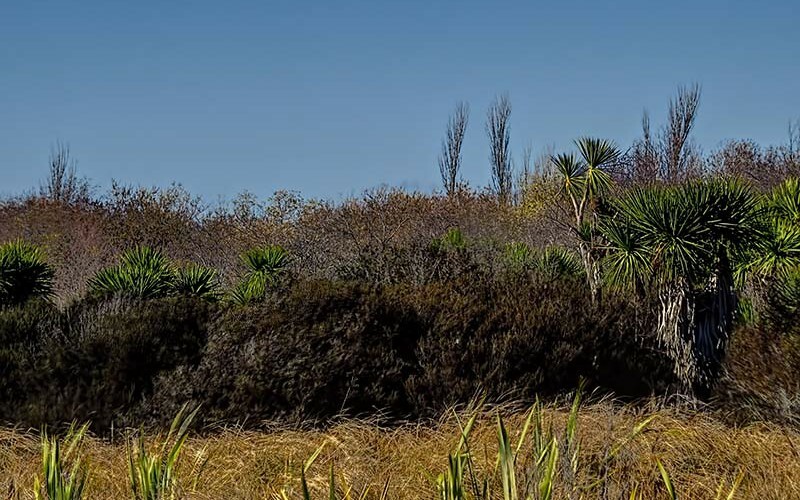 Upright patches of the rare baumea sedge are a remnant vegetation type, now present in coastal Canterbury only in small threatened populations. This sedge stands tall among the flattened areas of introduced carnation sedge and soft rush near the manuka-shrub peatland. Can you find this plant? The Kingfisher would be one of New Zealands best known birds. It is called “sacred” for it was said to be a holy bird for Polynesians, who believed it to have control over the waves. Both sexes are similar, but females are usually more dull-colored. Juveniles have rusty-brown edges on the collar and underparts. Kingfishers nest in burrows dug in clay banks or old dead trees.